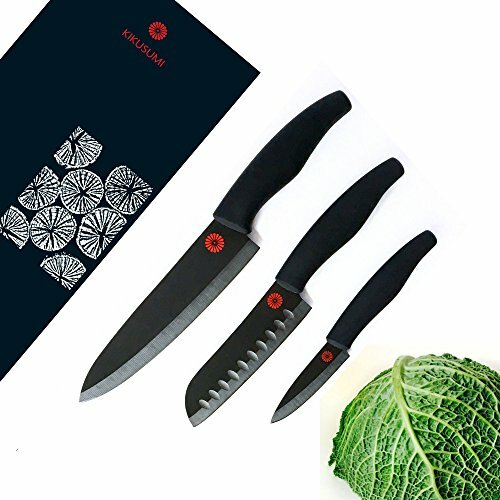 Kikusumi Black Ceramic 3-Piece Knife Set combines imagination, craftsmanship and technology in creating a knife that is sharp, precise, and light. Let Kikusumi inspire your passion. SPECIAL CARE Not for chopping bone, twisting or striking. Use on wood or plastic cutting surfaces. Hand wash. MEMORABLE GIFT We took extra care in designing a memorable unboxing experience. From the moment the knife gift box is opened the Kikusumi story unfolds, showcasing original craftsmanship and elegant style and colors. We have created a gift for cooks worth giving to the those special people in your life. PLATINUM WARRANTY 100% Lifetime Warranty against defects. Try risk free. SHARP LIGHT PRECISE: Matte Black Ceramic knife set contains our special proprietary blend of ultra-premium quality zirconium oxide forms knives that are 50 % harder than steel knives. Each blade is ground to a double bevel edge then sharpened to a precise 11-13 ° angle that stays sharp and holds its edge longer. Perfect balance and knuckle clearance between the blade and handle. Black knife blades are fired at temperatures above 2700°F and stay razor sharp 10 times longer than steel blades. ERGONOMIC HANDLE: Ambidextrous knife handle is designed to fit the human hand comfortably - for either left or right hand cutting. The ergonomic shape is based on traditional Japanese knife design and features flowing contours that hug the curves of the hand. Finished with a soft tactile grip that prevents slipping even when wet. Smart pressure point location facilitates the knife cutting motion. INTELLIGENT DESIGN: The 3-Piece Knife Set set contains unique ceramic knives for specific cutting tasks: 7 inch Gyuto Chef Knife for cutting large quantities of food + 5 inch Santoku Knife ( Japanese Knife ) for precision peeling and slicing + 3 inch Paring Knife with amazing dexterity for working in tight areas like trimming, coring and peeling fruit and vegetables. 3 piece knife set comes with 3 custom fit protective knife sheaths + a Cooking App for IOS / Android makes it ideal for daily use. LUXURY KNIFE GIFT BOX: Knife blades undergo a second firing to sinter a beautiful red Kikusumi logo that adds artisan luxury to the minimalist design. Hi tech laser cutting of Kikusumi signature logo and packaged in a gorgeous magnetic knife gift set box creates a memorable gift opening experience. 100% GUARANTEED - The Kikusumi Platinum Warranty guarantees 100% satisfaction with a Lifetime Warranty against defects. We also publish books to help you cut better and cook better. We believe in our products & we want to build your trust. Try it Risk Free. View More In Specialty Knives. If you have any questions about this product by Kikusumi, contact us by completing and submitting the form below. If you are looking for a specif part number, please include it with your message.